I teach Relief Society. It is possibly one of the most treasured callings I have ever held as a member of the Church. Even years ago, when I was the counselor over the teachers, I assigned myself to be the substitute teacher whenever anyone was out for the day. I just LOVE teaching Relief Society. I think the reason why is because it not only “forces” me to delve into the topic and matter at hand, but I also have an extra measure of the Spirit to guide me and so I learn that much more. I read the lesson weeks in advance and ponder it for the month. Usually something happens in my life or in the world to give me perspectives on how best to teach the topic for the sisters I am privileged to teach. Well, not this last lesson. I’d read it—and felt extremely guilty and terrible about myself. I pondered it all month, as I tried desperately to live some of the principles taught. I was a complete and utter failure at that, as well. I read it again, and felt like the weight of the world was pressing down on my shoulders. So, Sunday rolled around, and before I even got up, my heart was pounding in my throat and I was fighting back tears. I played a recording of “Love is Spoken Here,” and I couldn’t stop crying long enough to speak. The first sentence out of my mouth, in that squeaky croaky voice of someone trying not to cry, was something like, “I am having a very hard time teaching this lesson, because I am an absolute failure at just about everything this lesson teaches.” Within the first 5 minutes I used my whole stash of Kleenex and moved on to a baby wipe from Abby’s diaper kit. There were a lot of really good comments made and we had small group discussions about some points—I mean, my husband is the Sunday School president and taught me the cool “new” way to teach, so it wasn’t that I wasn’t confident in that part of the lesson. I just felt like a big, fat hypocrite. The last comment of the lesson was given by the mother of my son’s best friend. She is “that” mom. The one whose house ALL of my boys want to go to all the time. They would never come home if I didn’t make them. Her kids are awesome, and she always has it together. Really. When we talk, she tells me how she doesn’t have it together, but when I compare us, she is doing all the things right that I’m doing wrong. Well, I had regained my composure before that (several times, as a matter of fact), but I lost it, again. Luckily it was the end, and I had someone read just one final thought from President Benson and then mercifully got to sit down. I was drained. I get a little choke-y just thinking about it. I learned something—it’s something I know, but I needed to relearn it, and learn it with respect to my own flaws and foibles. Our Heavenly Father never tells us that we are not good enough. He may, through the Spirit, tell us that we are not doing enough, but He will never make statements about who we are unless it’s to tell us that we ARE His children, that we ARE divine, that we ARE the subjects of His work and His glory. The devil will tell us that we are failures. He wants us to stop trying, so he will overwhelm us with all the things we aren’t doing, and use it as evidence to prove to us that we have already failed. That discouragement, that heavy weight that he piles on top of us, keeps us from moving towards God. That is how we know it is not from God—if it is not encouraging us to do good, it is not from him, but from the devil. The devil will try to pull you AWAY from our Heavenly Father and the Atonement. Heavenly Father and our Savior will always draw you nearer. The devil is going to tell you “NOTHING” you do is right. The Holy Spirit will prick your heart to work on something. Then, when you’ve mastered that, there will be something else. Always onward and upward. I still see so, sooooooo much I need to do to be a better mother. The difference is, that I know I can do it. Every time I stumble, I get up, I repent, and I try again. This week was better because of it. I wasn’t perfect, but I continue to try, because I know I can improve. 27 And if men come unto me I will show unto them their weakness. I give unto men weakness that they may be humble; and my grace is sufficient for all men that humble themselves before me; for if they humble themselves before me, and have faith in me,then will I make weak things become strong unto them. Our Heavenly Father and Savior love you, and they will not abandon you. 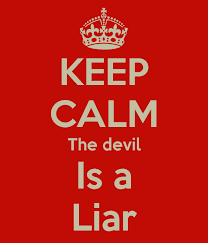 Satan is big fat stupid liar, and he will do everything he can to drag you away and make you build up a wall around yourself so the Savior can’t reach His hand in to pull you out. Kick Satan in the figurative teeth, and remember. God loves you. You ARE His child. You ARE divine. Our Savior will do—no, HAS ALREADY DONE—what is necessary to make it possible for you to be all that you dream to be, and more than you can imagine. Beautiful!!! And so, so true. And thank you for being an answer to my unspoken prayer, because we had this lesson last week (and I felt EXACTLY like you did) and I remember thinking I wanted to sit down and read it with my husband so we could take a little parenting inventory. Well, then I promptly forgot that this great info was in this lesson- I kept thinking I'd seen it in an Ensign article or Pinterest or something! I'm actually sitting here with the two most recent Ensigns right next to me because I was trying to remember where I saw it! Now I know! Thank you SO much! And this quotations: "Satan knows you name, but he calls you by your sin. God knows your sin, but He calls you by your name." Thank you Kasey, for your kind comments and also for the added insight! So we'll put. I needed that reminder. That is well put. :). Love to read your stuff. I heard a teaching once where a pastor said we're all going to laugh when we get to heaven and see that Satan is runt. :-) He has NO power.